Like my new toy? Ha, no. It is not a medieval form of torture. It's a skinfold caliper and it will help me measure the amount of body fat in my clients. The skinfold caliper is actually one of only two different methods used to measure body fat percentages. The other method involves a large tank of water and some specialized electronics, which I clearly don't have access to. What about a scale? Well, they only measure total body weight. In other words, fat plus bones, muscles, organs, etc. 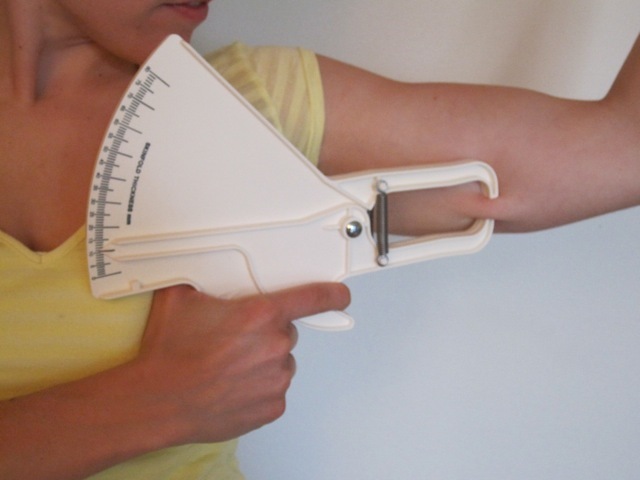 With a skinfold caliper, you can measure fat alone by pinching a few (you guessed it) skinfolds. The resulting percentage indicates how much of your body is actually fat—otherwise known as adipose tissue. And with a little math, you can figure out out how much that adipose tissue weighs. Most of the fat we carry sits just below our skin which is why this method is fairly accurate. I know, I know...you'd rather not know! But if you keep track of your body fat percentage, you can understand exactly how your body composition (ratio of fat to muscle) is changing. And your body composition will change as you age. Body fat percentages are especially handy if you are trying to lose weight. Let's say you weigh yourself once a week but the numbers on the scale aren't changing. If you've been keeping track of your body fat percentage as well, you might show a steady decline which would indicate that you've been shedding fat and gaining muscle. But if that body fat percentage hasn't changed or if it got bigger, then it might be time to rethink your diet and exercise program. Keep in mind that there isn't one ideal body fat percentage. It all depends on you and your individual body. While body fat percentages can be too high, they can actually be too low as well. Our body does need some fat to function properly, so at the very least, be realistic about fat loss goals. And if you're wondering whether or not it hurts—the calipers themselves are harmless. It all depends on how hard I pinch your skinfolds. But don't worry, I'll be nice (insert evil laugh here).